That Studio has been producing high quality effects and post tools for the industry for some time now. However they’ve recently created a cornucopia of new content, from visual effects, music, sound effects and even their new That Studio Panel, allowing all their content to be previewed for free. We spoke with Laura Leigh, That Producer at That Studio, at NAB for more on the many creations That Studio produces. This free panel for Premiere Pro and After Effects allows you to browse all That Studio content, from VFX to music, and sample it within your editor of choice. Then, if you’d like to buy the bundle, you can easily do so within the panel and drag and drop you files into the editor. Unlock the entire Effects HD library forever! Hundreds of gigabytes of practically shot visual effects, custom-crafted effects in up to 2.5k resolution. 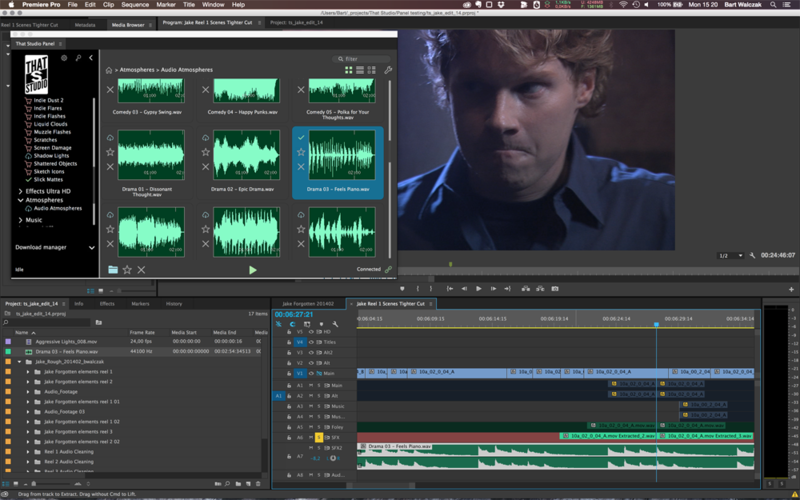 Preview everything with the THAT Studio Panel for Adobe Premiere Pro CC 2014 or After Effects CC 2014. Includes the entire Effects HD bundle! Includes every product we ever release in THAT Studio Effects HD! Atmospheres Volume I and II, with 100 audio and music atmospheres for film and television designed to move your story forward, each atmosphere is a wave file that comes with its stems. Hand-crafted, hand-created, composed atmospheres Designed by Jesse James, just for you. Bundle includes Atmospheres I and II, Cinematic Music, Corporate Music and Sound Effects Volume I! As you can tell from the prices above That Studio has several sales going on right now through the end of May. So be sure to visit ThatStudio.com to check out their awesome line of post production products.